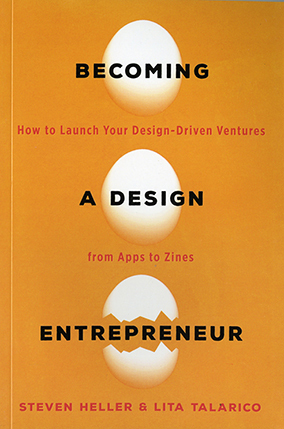 Becoming A Design Entrepreneur builds, in part, on the curriculum of The School of Visual Arts MFA Design/Designer as Author + Entrepreneur program. With the help of our faculty, alumni, and staff, we have fine-tuned this material for nearly twenty years. It is part handbook and part casebook, addressing how designers can accelerate their concepts as marketable in the analog and digital worlds. When we began using the term “design entrepreneur,” the two words were rarely uttered together. Now, the next big thing in graphic design —in fact, in all design disciplines— is entrepreneurship. The United States is a land of inventors, and entrepreneurs and designers have virtually all the skills needed to conceive, develop, research, and produce—in short, make—products for a marketplace. What was missing when we began were business, presentation, and promotion expertise. Entrepreneurship is risky yet empowering. Taking ownership of ideas and fabrications, either alone or in collaboration with others, is a goal worth pursuing and an opportunity worth taking. Even failure is an opportunity. Entrepreneurship is a learning process. The designer must learn to incorporate design talent with business skill to ensure the outcome of any sustainable venture.